We have a range of essential ESD stationery items designed for protected areas. Standard office stationery is often made from high static generating materials, often over-looked as sources of potential electrostatic damage. Used in a controlled environment, Antistat ESD stationery products have been developed to reduce and contain the risk of damaging sensitive components or devices. We can always source more products for ESD stationery, so if you require something specific, please send us an email and we’ll get back to you. These Antistatic Ring Binders are designed to replace standard high charging insulative binders within the EPA. 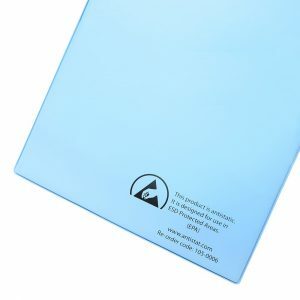 In portrait orientation, these folders are finished in high quality, permanently antistatic blue PVC and come with either 25mm or 50mm rings. The ESD warning symbol is featured on the front and spine of the ring binder, and there is also a 65mm spine label pocket for efficiency. Available in 2 and 4 hole configurations, with either 25mm or 50mm D-ring mechanisms. Conductive Trash Cans, when used in conjunction with our range of anti static trash liners, provide a comprehensive ESD safe solution to waste disposal. Our bins are available in two variants: square fibreboard or round polypropylene. Featuring the ESD logo for easy identification, these bins are designed specifically for use in EPAs. Open top permanently anti static Document Wallets designed to store documents without generating a static charge, unlike standard office stationery, making them suitable for use within an EPA. Available in A4 and A3 and EN 61340-5-1 compliant, these are an essential product for any EPA. Available in packs of 100, in A4 and A3 sizes. Our ESD Trash Liners are specifically designed for the particular needs of the electronics industry and, when used in conjunction with our range of conductive trash cans, give a better ESD-safe solution to waste disposal in an static controlled and protected areas. Available in a range of five colours, these 110 liter trash sacks are sold in packs of 100.